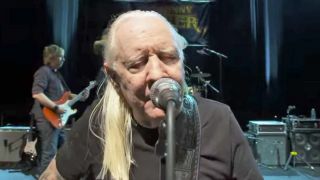 A bonus scene from the Johnny Winter documentary Down & Dirty is being exclusively premiered with TeamRock. The clip shows the late bluesman and his band sound checking before a gig in France. Down & Dirty was released earlier this year by Greg Olliver, known for his work on the acclaimed Lemmy documentary. A previous outtake saw Winter talking about his Gibson Firebird guitar. Winter died on tour in 2014, at the age of 70.